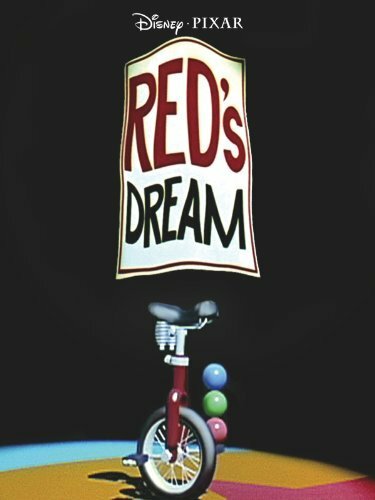 Of Pixar’s first 5 early shorts Red’s Dream is probably my favorite. It’s so beautifully realized and has tremendous heart. Released in 1987 for the SIGGRAPH conference Red’s Dream feels less like a proof of concept and more like an actual story. It is not one that I have to make excuses saying ‘it would look better but they developed the technology while making it”. No, this one looks great on its own. It starts out with a gorgeous cityscape. It’s a rainy night and we focus in on a bike store and then on a little unicycle who is dreaming of an incompetent clown. 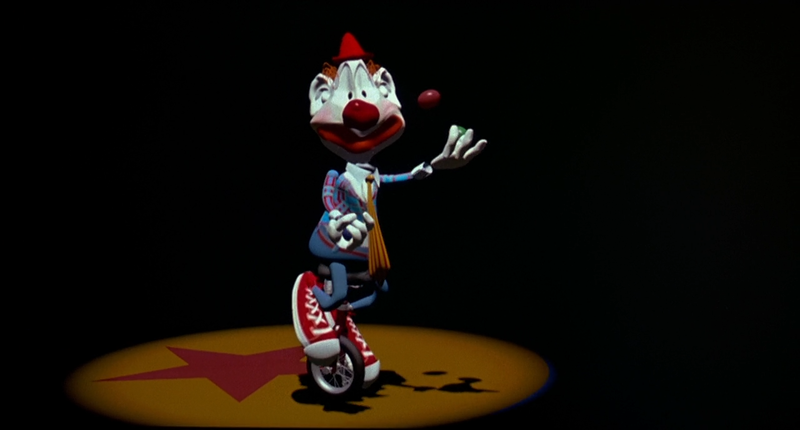 Red of course is the true star not the Bozzo clown. 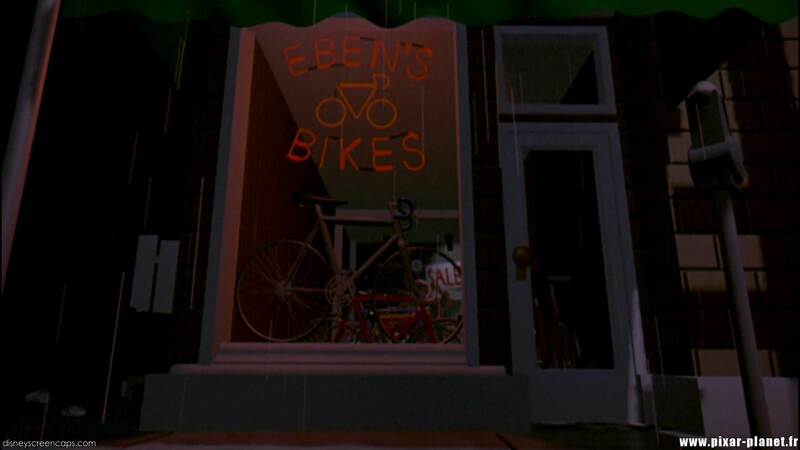 Director John Lasseter says in the audio commentary they picked the project because Eben Ostby (hint Eben’s bikes) had taken up a fascination with bikes and they had a 3D digitizer that could load sculptures and animate. Early animator Bill Reeves used it as a chance to work on animating rain which it looks flawless. Lasseter says “I’d say it’s the Pixar blue period” because there isn’t really a happy ending to the piece. 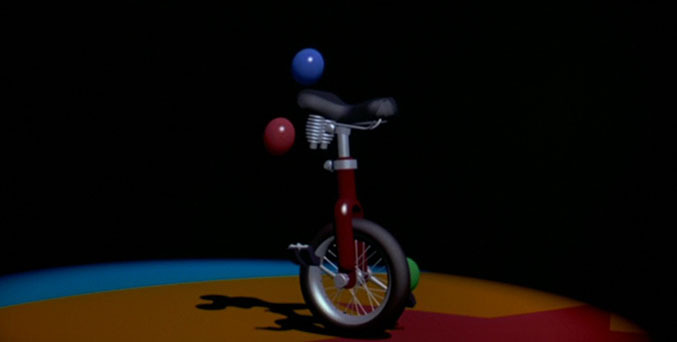 It is really quite sad for our little unicycle but there is something about that which makes it feel vintage and old school animation like a Dumbo or Pinocchio. This was also the first time they animated something at night and again they did an amazing job. As with all these shorts it has the feel of a silent movie like a sketch you might see Chaplin or Buster Keaton do but certainly with enough pizazz to appeal to a modern audience. The music is by David Slusser and there is an article at http://www.sfgate.com that says “pixar sound editor by day, saxman by night” Evidently he is the one playing the perfect bluesy saxaphone accompanying Red’s Dream. I think he wrote the music too. Pretty great. I wonder if this was a precursor for Cars. Do you have a favorite of these 5 early shorts? I don’t think so. I haven’t seen them in a while anyway, so I’d have to rewatch them sometime. But if I had to pick, maybe it’d be this one. I’ve never listened to an audio commentary of any movie before. Oh you miss out. They are so interesting. 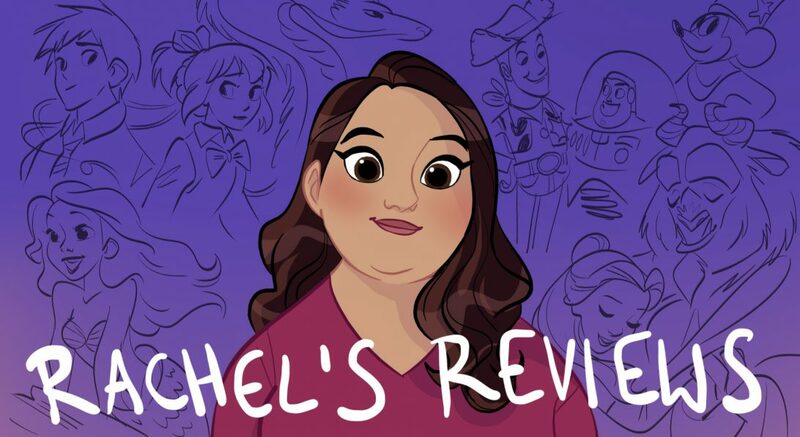 Pingback: Pixar Review 5- Knick Knack | Reviewing All 54 Disney Animated Films And More!